New Flyer Industries, Anniston location, provided unparalleled opportunities for customers to test out the latest in bus tech. Electric cars and buses are no longer a work of science fiction. According to Mass Transit Magazine, in 2017 the number of delivered electric buses in the United States jumped by 83 percent in the last year. While that may come as a surprise to some, the team at New Flyer Industries were well ahead of the game and prepared for the surge. Wayne Joseph, the president of Transit Bus Business at New Flyer Industries, says the company jumped on the opportunity to educate those on the benefits of electric battery-driven buses. “We thought it would be in everyone’s best interest if we built a Vehicle Innovation Center [VIC] where we could bring customers and suppliers together for educational purposes because there’s a lot of misinformation or lack of clarity in both battery electric vehicles and autonomous driving,” Joseph explains. The company built it’s VIC in Anniston, Alabama. The VIC is the first innovation lab of its kind in North America, according to New Flyer. With locations in Canada, New York, Alabama, and Minnesota, New Flyer Industries is the largest bus manufacturing company in North America and delivers buses to clients, mainly various transit authorities, across the country. This year alone, Joseph says New Flyer will deliver 2,800 buses throughout North America. “It’s everywhere. Right this week we have 32 different customers in our production facilities so we’ll get orders anywhere from 1 to 2 buses to several hundred buses anywhere from New York to Miami to Columbus, Ohio … there aren’t many cities that we don’t have a significant presence in,” he says. The 30,000 square foot VIC was opened in October 2017. The Anniston location, Joseph says, serves more than convenience. “The reason we picked Anniston is because … it’s the first [manufacturing facility] where we started manufacturing battery electric buses in large volumes. 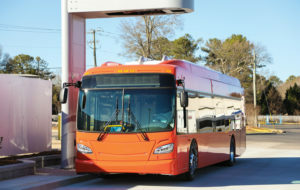 It’s also centrally located with easy accessibility to the Atlanta Airport and [in the past 20 years] Alabama has become a magnet for the automotive industry.” The Anniston location currently builds on average 14 buses per week and the goal is to increase that number with further investments in the electric bus programs. Upon entering the VIC, customers are first greeted with a video message from New Flyer’s CEO, Paul Soubry; from there they can make their way through a visual history of New Flyer Industries, see options regarding different battery styles and battery charging stations, and get a closer look at what makes an electric bus tick. The main hands-on technology of the VIC is the electric bus simulation piece, which allows individuals to experience numerous possible situations a driver may experience behind the wheel. The simulation provides various weather conditions from heavy rain to snow and customers can even experience what it feels like to have a tire blow out on the road. The simulation is the world’s first application of the Digital Projection E-Vision 4K projector and Joseph says it is one of the more popular aspects of the VIC. Everyone from board members to bus drivers enjoys the experience the VIC provides, he says. Clients can experiment with a computer program which helps them understand how some custom buses can be improved upon. With the touch of a finger, clients can configure possible distance traveled and typical fuel saved based on variables such as state of battery life, the number of passengers, and outside weather conditions. For example, a bus with a brand new battery series that’s full with passengers may travel farther in a moderate climate versus a hot or cold climate. While these factors may seem insignificant to the untrained eye, they are vital issues to consider when ordering electric buses. Though the premise of electric- powered transportation is nothing new in the automotive industry, Joseph says customers are still unsure about the specifics. That’s where the VIC comes in. 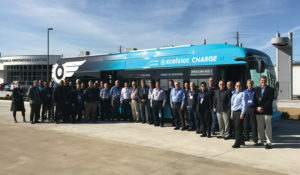 “Our customers are interested in electric buses but they don’t know what questions to ask or the specifications, so our mission of this Vehicle Innovation Center was to explore advanced technology, foster discussion of the education and dialogue, engage anybody that’s going to come in contact with these vehicles, and generate commitments to the quality and safety,” he explains.